Our indoor golf simulator combines the latest in technology with realistic graphics and superb special effects in a state-of-the-art indoor golf simulator. With our indoor golf simulator, you use real golf balls and real clubs and can choose from our huge selection of world famous courses. 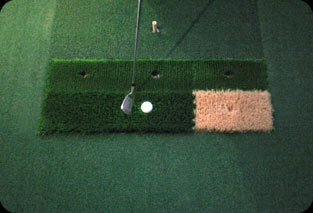 Our indoor golf simulator is as near to actually playing the courses as you can get - three infra-red ball tracking sensors provide flight characteristics so realistic that the screen will recreate the slightest draw of the golf ball to the biggest slice, right down to the subtleties of a putting stroke on the world's finest greens. No other golf simulator has this degree of accuracy or technology. Our golf simulators state of the art computer tracks the ball's trajectory, calculates its velocity and plots its vector curve and spin rate with hair splitting accuracy. The result is a precise calculation of the balls flight accurately reproduced on the screen with the ball bouncing and rolling across the course - along the fairway - onto the green or into a hazard (!) depending on the quality of your shot. The hitting mat recreates the conditions from the real course, with a different lie for the fairway grass, medium rough, heavy rough and bunker sand. The 12' x 10' ultra bright screen displays a brilliant, clear view of the game with 16.7 million colours. The screen graphics are so detailed that they include waving flags, aeroplanes helicopters, birds, animals, other players, water reflections, improved textures and more. The sound quality is also fantastic! You really need to experience our indoor golf simulator for yourself, as it's very hard to describe this awesome and fun golf experience! Click here to book now. If you like golf, you'll love this! Book the whole simulator for £15 for the first hour and £12.50 for every hour afterwards. *Offer available for a limited time only. The hitting mat recreates the conditions from the real course, with a different lie for the fairway grass, medium rough, heavy rough and bunker sand.